The patient is examined by the dermatologist or a certified physician in an examination room, using a hand magnifier or an analogue dermatoscope. Then, utilising a skin marker, the examiner tags conspicuous moles to then digitally document the finding. Finally, all marked nevi are scanned with a digital dermatoscope to then archive them for a follow-up. In many practices this documentation takes places in another (examination) room. Using our wireless dermatoscope the physician can examine the patient in virtually every room of his office.Making positioning easy, moles are directly being displayed on the Dynamify Cam and can then be viewed with a magnification of up to 30x. There is no need for marking critical moles- they are rated instantly and saved to the Dynamify Software with one click. Images can by allocated and amended momentarily. Benefits: One-step procedure, no additional staff required and work spatially independent. 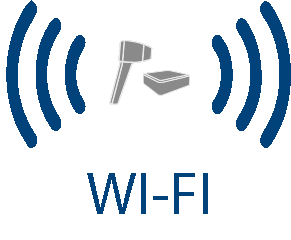 Wireless technology in your office means more mobility! The Dynamify Wireless Dermatoscope is the first system worldwide, which – owed to its wireless technology – can be used in almost every room of your practice. The Cube (server) is integrated centrally into your office’s local area network. Camera and software can be operated room-independently. Connect the Cube with your centrally located office router or switch using a network cable. 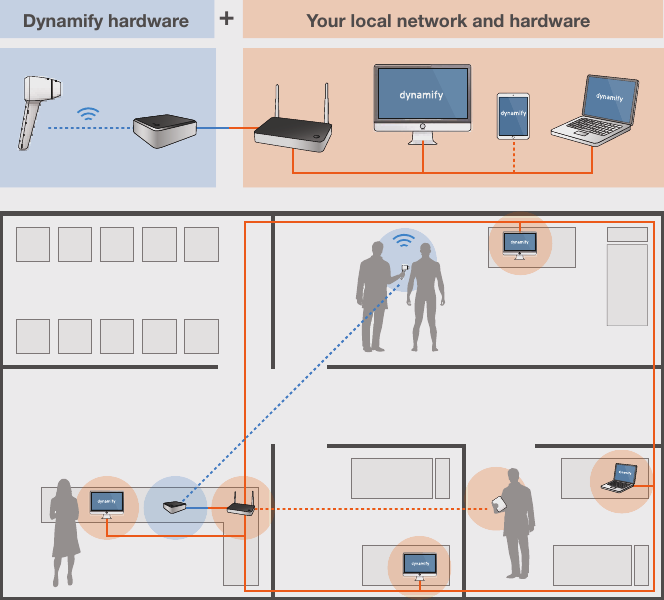 (blue-orange) This can also be done via a centrally located network jack, connecting directly to the router/switch. The Cam (blue) can be operated within the range of the Cube in various examination rooms. Depending on building fabric and dimension maybe even all throughout your office. To extend the operating range of the Cam, a signal repeater can be used.